Gorgeous 3 bedroom, 3 bath penthouse with private hot tub, incredibly easy ski access and so much more. With its ski-in/ski-out location, Trails Edge Unit #10 is a remarkable 3 bedroom, 3.5 bathroom ski Penthouse condo with the capacity to sleep 6-8. This condo features top of the line appliances, finishes, and a private hot tub. Enjoy elevator access directly into your unit as well as a heated garage parking spot. Location, views and high-end features make Trails Edge Unit #10 a skier's dream. There is one reserved parking spot in the private garage. This is pure luxury. Rustic beams carry the vaulted living room ceiling from the hot tub deck to the large stone fireplace. The large windows have a commanding view across the valley to the 13,500' peaks of the San Sophia ridge. From the lobby or the heated garage, the elevator delivers you directly into this penthouse condominium. This condominium sits comfortably several stories above the single family homes below, so nothing interferes with the dramatic views. It has flat panel TVs in the living room and each of the bedrooms. There is a large gas fireplace in the living room and a smaller fireplace in the master suite. The recycled chestnut lockers in the ski room provide an old world atmosphere as you pull on your boots and head out to the slopes. Master - The master suite has a corner fireplace and a super comfortable king bed. The master bath includes a relaxing jetted tub and two shower heads. Guest Master - The main level guest suite can be set up with a king bed or two single beds and has an attached bath. Bedroom #3 - Upstairs, the guest room has a queen bed and the bonus game/TV room located through the bathroom. Bonus Room - the most comfortable queen sized pull out sleeper sofa. Our private ski-in/ski-out access path is a short walk up the heated street. If you end up skiing into the Village or the town, you can ride the free gondola back to Trails Edge. We sought out properties in this location having had a great experience two years ago. The whole experience using latitude 38 was simple and wonderful. We truly love that the property is totally equipped, and high end, but still has the touches of Home. For example, its so nice to see a few personal photos of the family that actually rents the condo, and that they leave simple things like salt, pepper, olive oil etc for your use. This is not always the case in other units weve rented, but makes it such a delight when youre there for a week. In this case they went a step further and put things in the fridge like ketchup, mustard etc and left a welcome package on the counter for us. All things we do not take for granted and were much appreciated. Our stay at the Trails Edge was fantastic. A rep from Latitude 38 met us at the property and gave us a tour. From that point forward, everything was great except for the lack of snow (which has nothing to do with L38). Prior to arrival - the booking process was simple / great website with pictures and transparency relative to rates/available dates/etc. I was also happy with the level of communications / responsiveness from the team when I sent emails prior to our arrival. In particular, I would like to recognize Alexandra; she was great! Latitude38 was exceptional in their attention to detail. I was impressed with Alison, Lisa and Jeff. Each of them were very responsive and willing to do whatever it took to make our stay incredible. Our flights were delayed and we arrived later than anticipated and they made arrangements for us to continue our stay as well as met each of our needs with regards to additional items. They even provided lift tickets for our entire group upon arrival and we're willing to help with grocery shopping service. Latitude38 team was fantastic! The property was clean and of very high quality. It is perfectly set on the mountainside with easy access to skiing in and out, walking distance to the grocery store and the Gondola system (which is free and fantastic). The view from the den windows across the valley to the mountains is unbeatable. Latitude 38's concierge service either took care of our needs perfectly or pointed us to a great service provider (ski equipment, snowmobiling, christmas tree setup, gifts for under the tree). 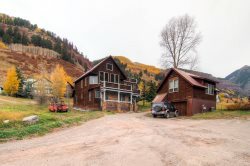 Overall it was a great experience and we felt the cost per night for the property was more than reasonable considering the amenities of the property and proximity and accessibility to Mountain Village and the town of Telluride. P.S. Everyone, from the Gondola attendants and grocery store workers to the locals on the street, was extremely friendly and helpful. • Limited Liability Insurance: $59.00 – Protects you up to $1,500.00 in accidental damage, theft or lost keys to a home.